My mother got me interested in Agatha Christie. Through high school and college, whenever I felt the need to read something that didn't require a lot of thinking, I'd pick up another one of Agatha's mysteries. I have always enjoyed how she twisted the plot; bent it in on itself; tossed in red herrings; killed off the one person you knew, for sure, committed the deed and; when the plot was unfolded at the end, who done it was not the person I thought did it. So many things in the story related to the main plot. Filming an Agatha Christie is almost the opposite of filming a Harry Potter. While plot points have to be left out in both movies, in Agatha Christie stories, leaving those items out can cause people to wonder exactly why a certain person was where they were at that particular time. 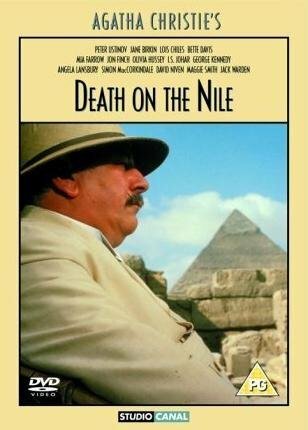 This is the case with the movie adaptation of Death on the Nile. Peter Ustinov is a fabulous actor and this movie contained a number of very well-known stars; Maggie Smith, George Kennedy, Angela Landsbury, David Niven, Mia Farrow, among others. But Peter Ustinov is not who I envisioned as Hercule Poirot. He's too, um, rotund. David Suchet who has portrayed the character on PBS is my idea of an ideal Poirot. So, I had to get past Ustinov. Then, they had to leave out so much. One of the big things, not to give too much away, is why Angela Landsbury's character was out on the deck of the ship to see someone moving about when they claimed to be in their room. That reason and her character's role in it is a big part of the later revelations. I can't say the movie completely desecrated the book. I understand the adaptation process, particularly of a book with a lot of characters who are given face time and a chance to tell their side of the story, is a prickly process. Some things that are vital to a book's story have to be left out. It's just that, with this book, in particular, what they left out meant some character's motives were uncertain or stupid. That's not a good thing when you're trying to figure out what's going on.